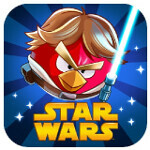 On Wednesday, we told you to expect new levels for Angry Birds Star Wars on Thursday. And sure enough, the game has received 20 new levels, taking you to Hoth where AT-AT walkers and Pigtroopers are found. The "Hoth Episode" of Angry Birds Star Wars includes Princess Leia (as an Angry Bird, of course). The great thing for game players is that the update is free. The Angry Birds Star Wars game took only 2.5 hours to hit the top of the iTunes charts when it was released earlier this month. The continuing popularity of the game fits perfectly with Rovio's goal to become the next Disney and is in sharp contrast to the falling popularity of some of Zynga's mobile games like "Draw Something". Rovio quite possibly has discovered a method to keep this franchise alive forever. In the great Disney tradition, Rovio has splashed its characters all over the place, from towels to t-shorts to thermos kits. This way, new generations of Angry Birds fans are born, taught in the ways of the game by their older siblings or parents. Why, it almost sounds like the continuing fervor for Star Wars, which ironically, is now a Disney franchise. You can check out a quick trailer showing the new "Hoth Episode" of Angry Birds Star Wars by clicking on the video below.